When Jo Alvey, from Bolsover, decided to set herself the challenge of running the Edinburgh half marathon with two friends, for Diabetes UK, she knew she would have to take the plunge and finally tackle her weight issues. Jo's 'before and after' pics. Right, celebrating completing the Sheffield Half Marathon. 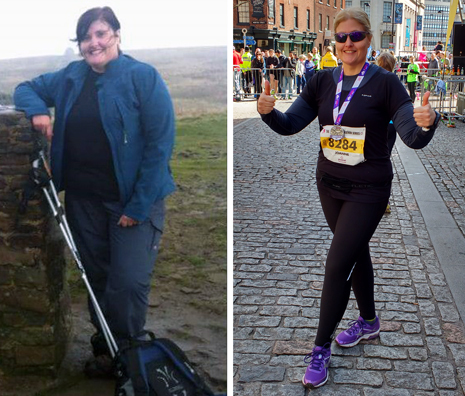 Now 3 stones lighter, having not only completed Edinburgh (raising £551.10 for the charity) but also two further half marathons including Sheffield (above right), she's looking forward to a healthier and slimmer future. The 47 year old Project Manager, knew that after years of yo-yo fad diets, she wouldn't be able to do this alone. So she decided to join the Danesmoor Slimming World Group, in September 2014, after seeing one of her former work colleagues was starting the group. "I was so embarrassed walking into group that first night. I'd not seen Charlotte in years and knew I looked massively different from when we'd worked together in the past. I shouldn't have worried though, she made me feel so welcome and in fact, I couldn't believe how friendly the whole group was. "That first night was something of a revelation for me as I expected to be told what I should weigh, but I was encouraged to decide a target for myself. I also loved the idea of unlimited 'free' food, such as fruit, vegetables, rice, pasta and my personal favourite, potatoes! I realised I had finally found something that I thought could work for me." Jo was still able to eat all her favourite foods, such as steak and chips with a large side salad, chicken and vegetable chow mein and salmon with roasted vegetables and brown rice - she just learnt to cook everything from scratch, in a much healthier way. In fact as the weight dropped off, it encouraged her to cook more than ever. She never felt hungry or deprived and could still indulge in the odd glass of wine, chocolate and her all time favourite, salad cream! "Before I started, I'd lived on convenience 'ready meals' and takeaways. I always felt tired, struggled to jog two miles and hated how I looked. I would try to avoid going out socially, as I always felt old, fat and frumpy. "That all started to change as I lost weight. I could get the 'nice' clothes (not just the ones that fit) and started to like how I looked. I was running further and faster, going to Zumba twice a week and felt fitter than I had as a teenager! But I know I couldn't have done it by just exercising (although I'm sure the body magic helped) it wasn't enough. I had to change my whole thought process about food, and I did. "I still can't believe I managed to lose 3 stones in just eight months and run 13.1 miles. It feels amazing!" Jo isn't the only one who has noticed a difference. Her partner, who has type two diabetes, has noticed a significant drop in his blood sugar levels, purely as a result of eating the new recipes she cooks. Around 700 people a day are diagnosed with Diabetes in the UK and obesity is one of the greatest risk factors for type 2 diabetes. In 2012 24.7% of adults in Derbyshire were classified as obese. Scarily, this level is feared to be much higer now. Jo said, "Not only do we both love the new meals that we are cooking but it has had a positive impact on our health." However, she credits the support she found in group as having a significant effect on her success, "I would never have been able to do this without the support and understanding of my group. "They encouraged my through the 'ups' and stuck by me through the 'downs' (and yes, there were a few gains along the way!). They always offered suggestions and encouragement when it got tough and I can't thank them enough!" 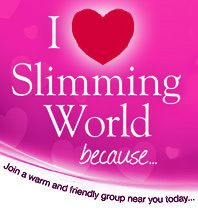 Jo loved her group support so much she's decided to become a consultant and will be re-launching the Chesterfield Slimming World group on Saturday 9th July. It is held at the Methodist Church on Derby Road every Saturday morning at 9.30am, "Everyone is guaranteed a warm welcome!" said Jo.